Hide your wallets, folks. Every dang game on the Play Store, it seems, is on sale today. Whether you're looking for a FPS, racing games, or something with the word Zombie in the title, there are plenty of options for you. 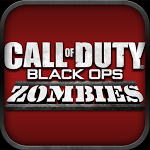 For example, Call of Duty Black Ops Zombies which manages two out of three of those qualifies at once! Normally, $6.99, this one's been dropped to $2.99. This sale will be going on through January 3rd.